As many as 100 tombstones broken at Philadelphia Jewish cemetery in second such attack in less than two weeks. Dozens of headstones at a Jewish cemetery in Philadelphia were overturned over the weekend, the second such incident against a Jewish cemetery in less than two weeks. Police say dozens, perhaps as many as 100 tombstones at the Mt. Carmel Cemetery were broken or overturned over the weekend. The vandalism was first discovered by Aaron Mallin, who came to Mt. Carmel to visit his father’s grave Sunday morning. “It’s just very disheartening that such a thing would take place,” Mallin said. Last week Tuesday more than 100 headstones at the Chesed Shel Emeth Cemetery near St. Louis were vandalized in a similar incident. The desecration of the Mt. Carmel Cemetery is not the first attack on a Jewish cemetery in Philadelphia. 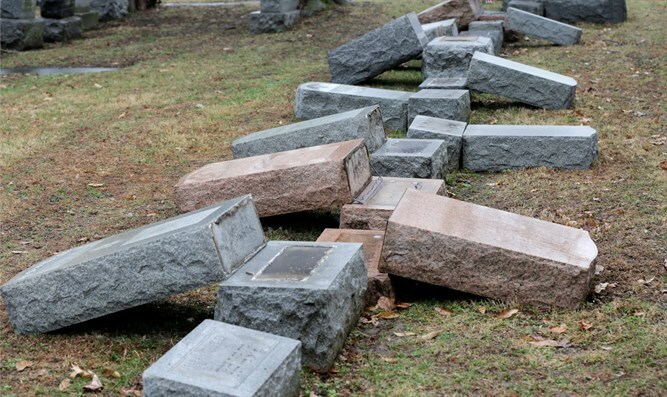 In 2015, 124 tombstones were toppled at the Adath Jeshurun Cemetery.